I know, because of the comments from last week, that many of you enjoy reading these Ten On Tuesday posts. And I’ll get to it in just a minute but first —- an announcement. Beginning in October Ten on Tuesday is going to become Ten on the Tenth. That’s right, we are going to a monthly list instead of a weekly one. I’m hoping this will keep those of you who already love these posts happy but I’m also hoping it will breathe some new life (and hopefully new participants!) into this format. Swam in the ocean. A lot. Had cocktails and snacks on the deck. Sometimes with Dale and sometimes with friends but all times awesome. Harvested lots of tomatoes, basil and jalapenos. Our garden was a success despite our dry conditions and lack of gardening knowledge. Got a cover all for my Summer Book Bingo. I invested a lot of time reading and I loved (almost) every minute of it. Traveled. 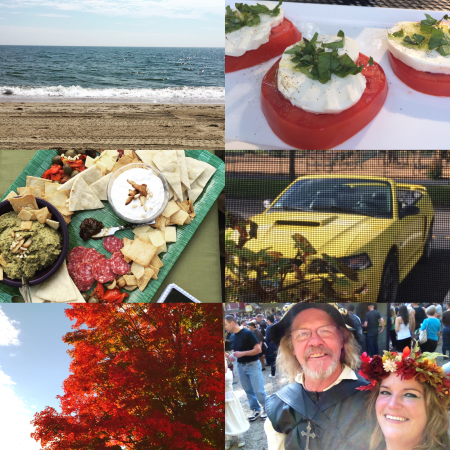 I went to Kalamazoo and Chicago and Lake Winniepesaukee and Cape Cod and it was all fantastic. Driving the Mustang with the top down. The dog days of summer are not ideal for convertible driving but fall is just perfect for it. Our first fire of the season. By January I’ll be tired of the dust and the mess but the first fire is one I always treasure. Going to King Richard’s Faire. We missed it last year but I’m hoping we get to go at least once, if not twice, this year. Watching football and eating all that yummy football food. Decorating the house (inside and out) for fall. Mums and wreaths outside, pumpkins and leaves inside, along with changing out the curtains and artwork in the den. I think fall decorations are my favorite. So, how about you? What did you do this summer that you loved? And what are you looking forward to doing this fall? If you wrote a post for today please add your link below. If you’d like to subscribe to the Ten On Tuesday (soon to be Ten on the Tenth) email list, please click here. King Richard’s Faire! It’s been 30 years but i remember the fun! And the first fire…so envious! I hope you get to King Richard’s Faire–I’m excited to see pictures. Fall decor ranks right up there as a favorite of mine as well! Great list Carole! I am so, so, so ready for FALL!! Bring it on! Fall is my favorite, and you can still do almost all of your summer favorites (except maybe swim in the ocean). Now, if we can only get rid of temps in the 90s and humidity it will feel like fall. Looking forward to Ten on the Tenth! We are trying to fit in a trip to King Richards this year too. It’s been ages! I love Fall decorations. It’s still to warm for me to do any yet! The glorious display put on by the aspens is definitely on my fall list! Then there’s Santa Fe–my brother has moved there–he should have known better lol! Great compromise! I will enjoy reading, and right now I’m going to go hang my fall wreath. Mustang with the top down!! I wish I could ride shotgun! Didn’t you go to New York City this year, too? Please don’t tell me that was last year or I’ll die! One thing I look forward to is the changing of the leaves and we saw plenty of that this weekend! I’m finally over my resentment that summer has to end. This topic was perfect for putting me in the right mood for fall! looks like a great week for participation – I think we’re all ready to celebrate summer and move on! I didn’t have room in my list for mums and pansies; planting fall is one bit of getting dirty I actually enjoy! Glad you’ll continue once a month- that’s probably the perfect solution.Were I to do this list, I’d have to work a little harder to find 5 for Fall. ….not quite there yet (grumble grumble grumble). Definitely the fresh veggies-we were blessed with lots of goodies from co-workers with gardens. I’m glad we’re “settled” in our new place, and this fall I’m looking forward to exploring more, football [and football food], and fall/winter knitting!